As a service to our readers, Pittsburgh Seminary is embarking on a sermon writing tips series. This is our first post and we hope you find it helpful. Be sure to look for other tips from faculty, staff, and alums in the months ahead. Have a tip you’d like to offer or have a sermon issue you’d like help with? Let us know by using the comments option. 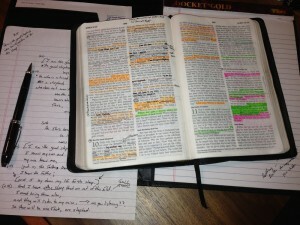 I have in the past three years preached with no notes. I went to Pittsburgh Theological Seminary where Bill Carl, former president and professor, is a big proponent of sermon memorization. I was in a class where he praised the benefits of sermon memorization. When I get compliments about my sermons, and they are not on the content, they are usually compliments about how much people enjoy how a sermon has been directed to them. How the fact that I look at them while I preach makes all the difference for them. 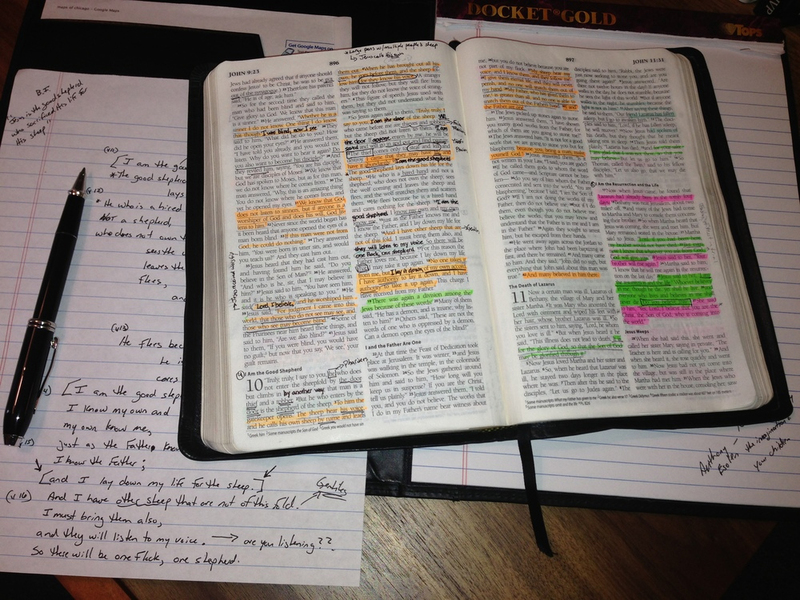 Here are several steps that I use for preaching without notes. 1. KNOW THE PASSAGE YOU ARE GOING TO PREACH ON WELL IN ADVANCE! This is crucial. You have a finite amount of time in each week. Do not use anytime trying to decide what you plan to preach on. The lectionary helps. However, what I do is spend a good bit of time in advance to map out a year, or a large part of the year. This also gives me the opportunity to take a look at the passage I will preach on Sunday night. 2. Wrestle with a passage early, but by Wednesday know your main point. Don’t change your main point unless it is some rare exception of sudden last minute epiphany. This provides you the opportunity to put on the lens of the passage and its main point when meeting with people. As you spend time with your congregation you will see how your main point needs to be communicated or bent a little to better reach your church. 3. Make outlines. I use Logos Bible software. I start making outlines. The outlines I write in the notes part of the program are reflecting the flow of the sermon I intend to preach. I won’t erase; I will just start another one if I want to change the sermon. The repetition helps me get my flow down. Each time I write the outline I try to use less words. So the first out line will be sizable in content but a jumble of thoughts. The last outline might be 50 words at most. In between I may have 10 outlines I wrote to get to the final outline. The Logos Software is on my phone and automatically syncs. So when I type it into my computer on Logos I have a flashcard in my hand and I can look at my outlines anywhere. 4. I don’t attempt to memorize a manuscript. I don’t write how I talk and I don’t talk how I write. If I tried to memorize a manuscript it would not be natural to how I talk. I realize manuscript memorization is important to some. I just have a tough time with doing it. 5. As I write my outlines I begin to recite in my head how and what I plan to say. This process really cements thins in my brain. It is also a process I can employ while I driving or shop. It is a process that is really a lifestyle. It also helps you pay attention to what you say so that you are not loose with words. 6. Write down notes of delicate things you want to say. If you are worried about phrasing of points, write them down. Don’t let the details of the memorization get in the way of the bulk of the memorization. If you have something worded with delicateness then you need to put it aside and memorize it in a traditional flashcard-type manner. 7. Sit with the passage. Know why you picked it and what you want to say early on. This will drive your process. It will help it reach home. It will hit its mark this way. If you are just getting to your passage on Thursday or Friday, this will not lend itself to this style of memorization. This blog was originally posted by the Rev. Dan Turis ’12, pastor of Colonial Church of Bayside in New York, on his site: http://danturis.com/. You can also follow him on Twitter @dturis.